ESIC Form 37 has to submitted by employer to local esi office that comes under its jurisdiction. In this post i will explain the purpose of the ESI Form 37 and include links to download form 37. You can also find filled sample forms to easily understand the fields in application form. 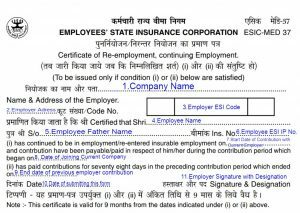 ESIC (Employee State Insurance Corporation) Form 37: This form is known as Certificate of Re-employment or continuing Employment. Form 37 is a declaration by employer with respect to employee reemployment or continuity of the employment during insurable contribution period to be submitted on demand by local ESI office. ESI Form 37 is also applicable when an employee resign and joins a new company. The new employer is required submit form 37 to carry forward the employees ESI Number. So, whenever your new employer ask you to fill the form 37, you must enter old esi number inorder carry forward the contribution you already made to your ESI account. The employer must submit the form that you submitted to ESIC local office to continue the ESIC old account. You need provide the following details in form 37 before submitting to your employer. So that they can forward it to ESI local office. I have provided sample esic form 37 here under. If you need detailed information regarding the fields in sample form, you can refer the detailed explanation. Write current Employer ESI Code. You may contact your HR manager for this information. Write employee name as it appears on Id proofs. Write employee father name according to ID proof. Write the employee ESI IP Number. If you dont enter this number, ESI will assign a new number. If you have changed your company, be sure to enter old ESI IP number without fail. Write the date on which you started contributing to ESI account after joining the new company or current company. Write the date on which you joined new company or current company. Write the last date on which you contributed to ESIC account when working with old employer. Your current Employer should sign and write the designation before forwarding the ESIC Form 37 to ESI office. I have provided ESIC Form 37 Filled sample here. Refer it if you have problem to fill the application.